At Cookbook Of The Day, I posted about seeing Matt and Ted Lee at the Smithsonian in April. They talked a bit about collards. In my family the only person to fix collards was my Great-aunt Mamie. She would wash them in salt water to clean them and kill any lingering bugs. Then she carefully cut away the large stems. Then the collards, back bacon, salt and a bit of water went into a large pan that cooked for at least 3 hours. When the collards were done, she pulled them out and chopped them before serving. At each place setting there was a china cup on a saucer filled with warm potlikker. The Lee Bros. remembered a wedding where one of the Yankee guest helped clean up and in doing so, threw out the potlikker. One favorite use for leftover potlikker is to poach eggs in the liquid the morning after. Alas, no potlikker poached eggs on that day. 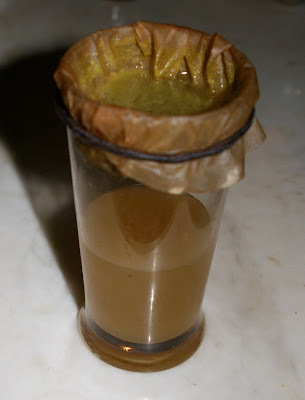 Now I am going to share with you two of my favorite uses for potlikker. I am, however, not going to tell you how to cook collards. But be advised, the flavor and strength of the potlikker is directly proportional to the person that made it. Mama's might vary from Grandma's and vice-versa. You want a potlikker that has a nice green color to it and is a bit on the salty side. Great potlikker takes time. 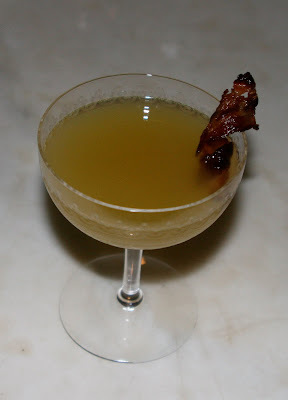 I told the Lee Bros. my favorite use for potlikker was a Potlikkertini. Frankly, there is nothing that can't be improved with a nice shot of vodka. I like to serve them in old-fashioned champagne coupes. They are served warm with a nice tuile of bacon. Rinse your glass with vermouth. Mix the vodka and potlikker. Add a bacon garnish. Now for something more complex. After the event with the Lee Bros. I was telling Anne that I liked to make a variation on oeufs en gelée with potlikker. 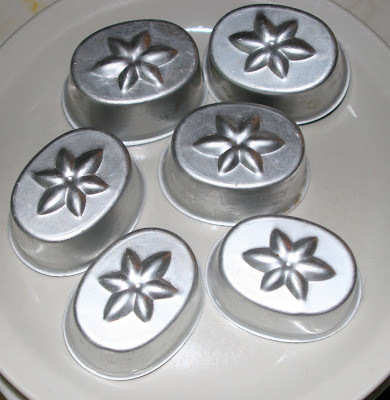 Anne said she had some molds she would never use again so, she gave them to me. It was a lovely night, The Lee Bros., a new cookbook, and new tins! My reservation about oeufs en gelée is the runny poached egg. The runny cold poached egg that dribbles out on the dish. Here is a very Southern way around that -- Deviled Oeufs en Potlikker Gelée. 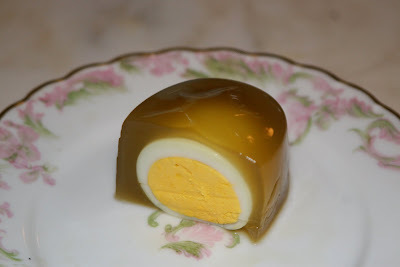 Yes, take your favorite deviled egg and drop in in aspic. 1/4 teaspoon chopped dill pickles. I know it is hard in America to find anything that is small. We love to jumbo-up everything, but try to find the smallest eggs you can. The tins I received from Anne were vintage. 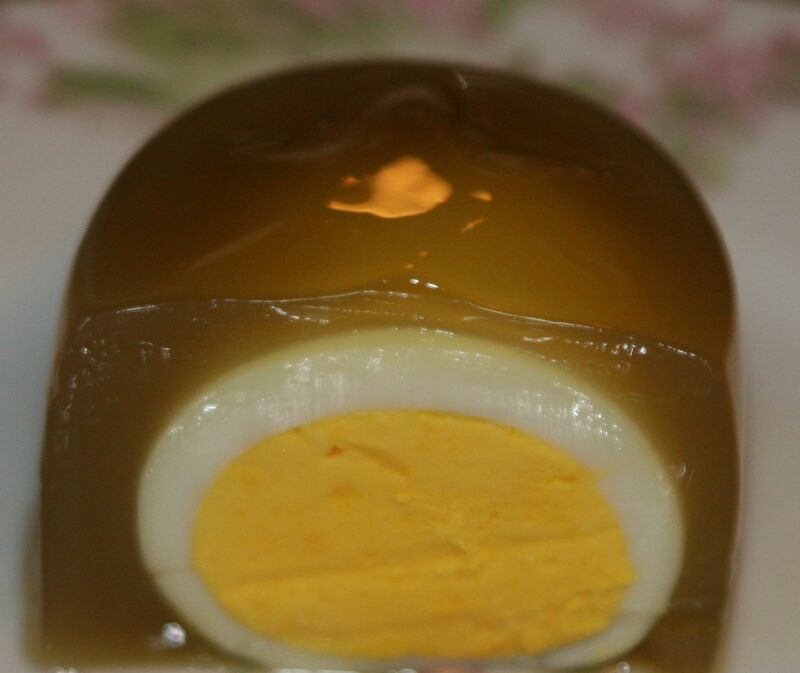 If I had used extra-large eggs, there would have been no room for the gelée. In fact, an extra-large egg would have filled the tin and then some. 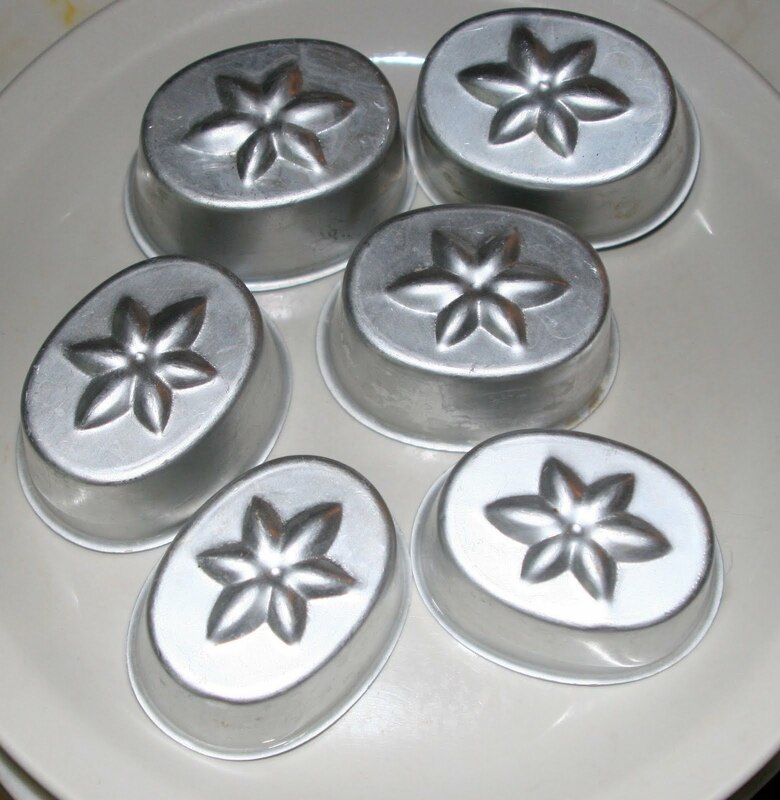 You can use small tins, ramekins, or any mold. Test the size of your tin or mold by placing an egg in its shell into the container. The egg should fit into the tin with about a 1/4 inch around to spare. Hard boil the eggs. (I always cook and extra egg or two in case one tears.) With deviled eggs, it doesn't matter if you separate them, but with these eggs, it is important to keep the egg halves together as you are going to put the halves back together and a tight fit is best. Carefully fill the cavity of each hale of the boiled egg flush with edge. Then put the two halves back together. You do not want any filling squeezing out. I keep a damp towel close by to remove any excess filling . 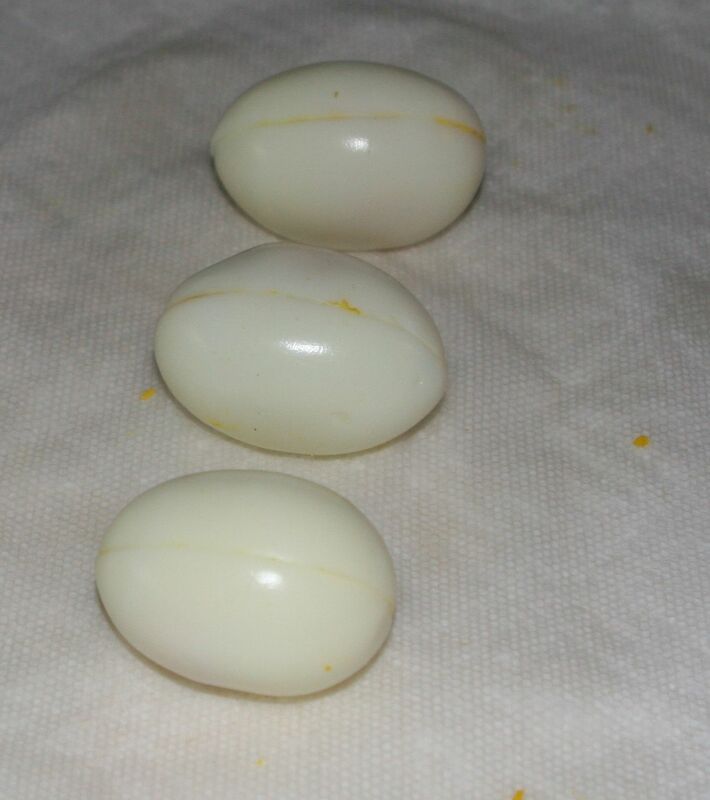 Place the deviled eggs in the refrigerator until ready to use. Strain the potlikker several times to remove the fat used to cook the collard and any stray bits of collards or seasonings that may be left behind in the potlikker. A coffee filter over a glass works fine. When the potlikker is strained, heat 1 1/2 cups in a sauce pan. In a measuring cup with a spout or a small bowl, add 1/2 cup of the potlikker and sprinkle with the gelatin, stirring to mix. Add the 1 1/2 cups of hot potlikker to the gelatin mixture and stir. Pour a small amount of the warm potlikker and gelatin into the bottom of each mold, about 1/4 inch. Place the molds and the remaining gelatin in the refrigerator and let the gelatin in the bottom of the mold set, about 10 minutes. When the gelatin in the molds has set, take the molds, the remaining gelatin and the deviled eggs out to assemble. To each mold, add one deviled egg, keeping the seams on the sides. 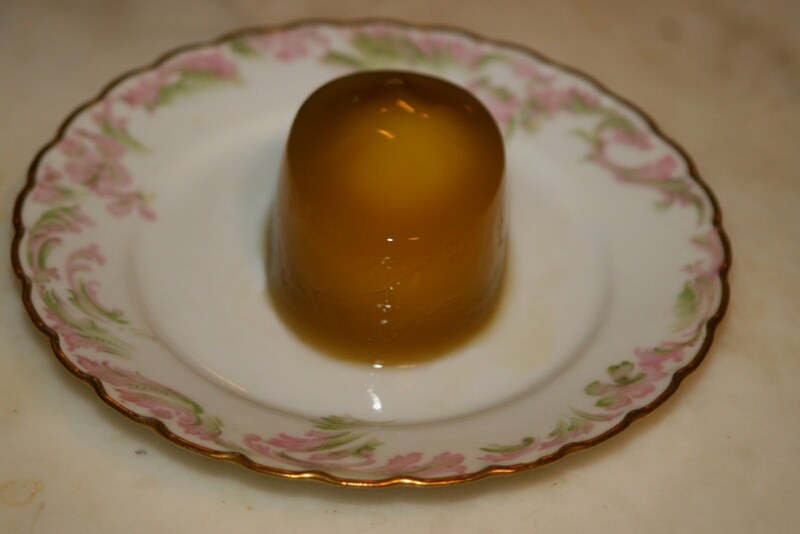 When the eggs are in place, take the remaining gelatin and give it a quick stir, then carefully pour over the egg, filling the mold. Return to the refrigerator and allow to set for at least one hour. Many times, the gelée is decorated in the initial pouring, by adding cut peppers or edible flowers, but the darkness of the potlikker makes that a bit harder. When you cut in, no runny yolk. You can see from these pictures that my eggs were a little big for the tins and were not fully covered. It is not really a problem. So now, you have some ideas of what to do with that leftover potlikker. I think these recipes sound delicious and I am book marking this page to try them some time. Anybody that can make good potlikker can imagine how delightful these recipes would be.